My studio recently completed the restoration of an antique tapestry mural. This is one of a pair of very nice ten foot tall panels that have hung in the lobby of a Spanish Revival apartment building in Pacific Heights since it was built in 1910. The murals are based on a 17th century Gobelins tapestry designs, and are printed on linen using the newfangled technique of silkscreen printing (invented in 1907) combined with the far more traditional printing technique of stenciling. One of the panels suffered some major damage: a large rip at the base, followed by a six foot long tear straight up the center. Some areas of the material were missing, and the surface was laden with nearly 100 years of accumulated dust, smoke, and dirt. 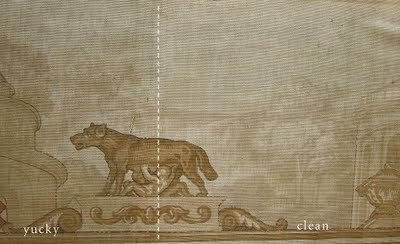 To restore this mural, we needed to clean and stabilize the entire piece, repair the damage, and recreate the lost areas. 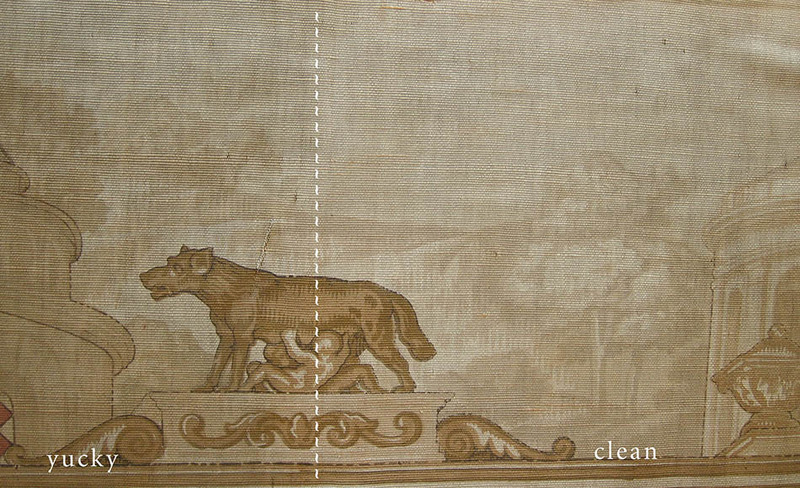 We started by removing it from its frame, and giving it a gentle cleaning front and back. 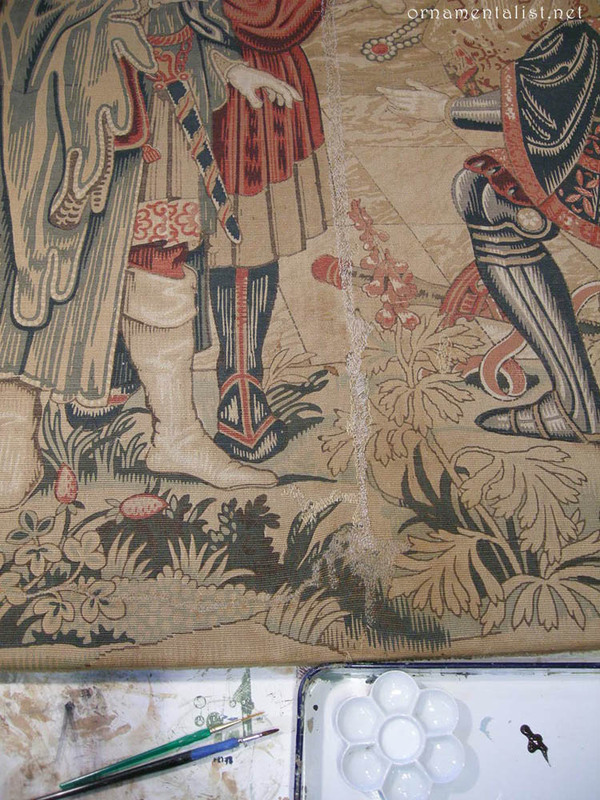 During cleaning, much of the more subtle detail emerged. 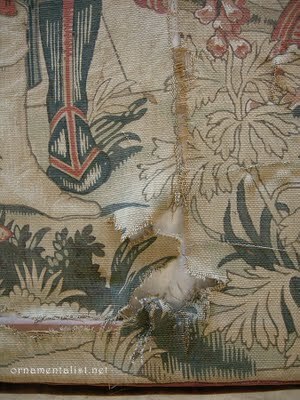 To stabilize the mural, we lightly stitched the major rips closed, then backed the entire piece with a new piece of linen. 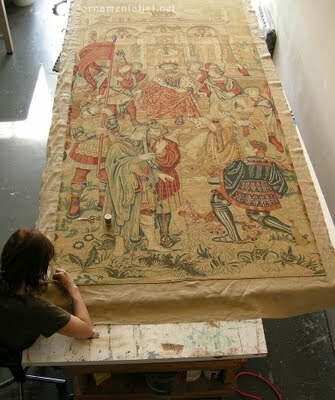 The perimeter of the panel was then sewn by hand onto the backing for added strength. My associate Angela is a skilled conservation technician who has worked for many years restoring art for museums and collectors. We met during a large restoration project in 1993 and she has assisted me on numerous jobs since then. Tears, rips and areas of fabric fatigue were painstakingly stitched to the backing, to prevent the rips from spreading, and to fill in for missing material. I mixed up eleven different colors of paint to match the tapestry's palette, which I then lightly daubed over the stitches to help them blend in to the surrounding areas. In some places the image was missing and had to be recreated. 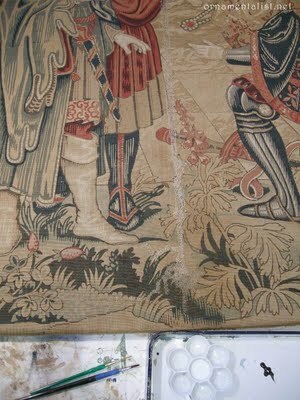 While not entirely flawless, the tapestry looks wonderful and its repaired sections are hardly noticeable. 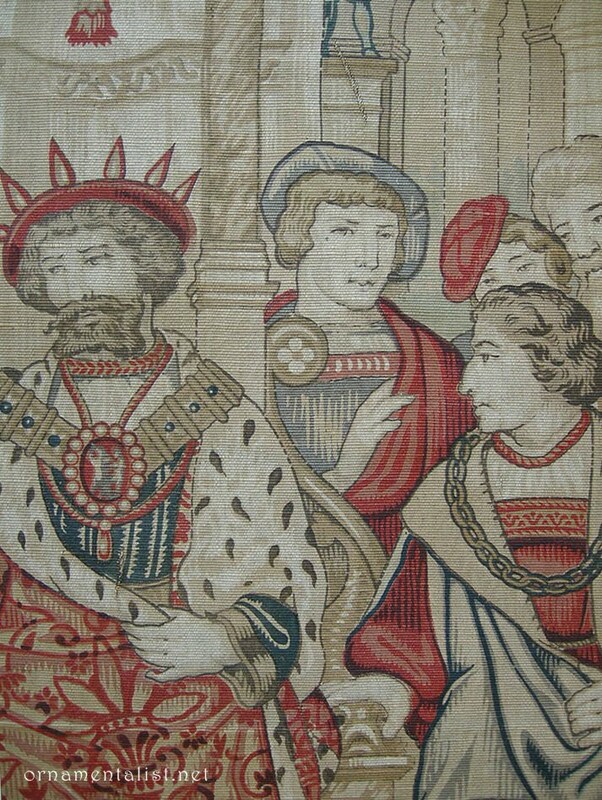 Beautiful printed tapestry and really interesting post !! I didn't know your studio had textile restoration skills too !! What are you unable to do, Madame Rutter ? A fascinating and very interesting post. Repairing and restoring a piece like that must give great satisfaction once complete. I enjoyed steam punk aquarium, we have a new octopus repeat stencil that you may just love, we do.